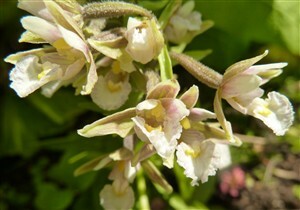 Epipactis palustris (14"). Marsh Helleborine with large unmistakeably orchid flowers in mid summer -mahogany red sepals & a central white and lemon lined lip. Easy and clumping well on moist, ideally neutral to alkaline soil (but mine grows on acid soil) sun or light shade.